If you're sick and tired of dealing with pesky upper-body fat, you're not alone: Many of us carry fat in our upper backs, torsos and upper arms. The good news is, you can easily trim the fat in your upper body by increasing your physical activity, doing targeted toning exercises and eating a healthy, well-balanced diet. According to Popular Science, there's no amount of exercise that can change where you store your fat: If you're a person who naturally stores lipids in your upper body, for instance, this will always be the case. This is because your hormones control fat storage (namely, testosterone and estrogen). This doesn't mean that you can't lose weight and look more toned; it just means you may have more trouble slimming down in certain areas than others. Upper-body weight loss may seem impossible, but it's within reach, provided that you're eating well and exercising properly. First, though, it must be said: Targeted fat loss (also known as "spot reduction") is a myth. It's simply not possible to burn fat from a certain area of the body through muscle-specific exercises. Rather, it's crucial to take a whole-body approach if you want to see results. This means increasing your overall physical activity and eating a diet that's low in alcohol, sugar, processed foods and saturated fats. Include plenty of protein in your diet (such as fish, eggs, nuts, seeds and tofu) and try eating five smaller meals per day as opposed to three large meals; this is a very effective way to lose upper-body fat. If you want thin, muscular arms and little to no back fat, it's important to know how to burn fat, and which exercises are best for toning up. 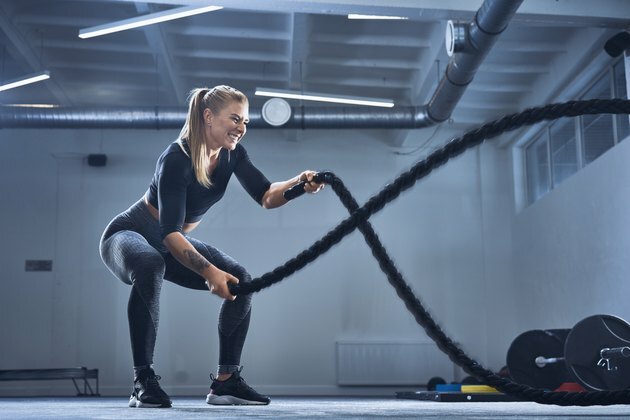 According to a study published in February 2019 in the British Journal of Sports Medicine, to successfully burn fat, interval training and moderate-intensity continuous training (MOD) can be effective. In the study, researchers compiled data from over 1,000 participants (both male and female) and found that both intervals and MOD led to reduced body-fat percentages. While keeping your elbows tucked into your ribs, your spine straight and your abs engaged, lower your chest toward the floor; do NOT strain yourself. If you feel any pain or discomfort, you've likely lowered too far. Start with one to two sets of eight to 15 repetitions, with a 30- to 90-second rest interval between sets, as recommended by the American Council on Exercise. As your body adapts, try doing this exercise on your hands and toes (regular pushup position) and increasing your sets; just make sure you're keeping a close eye on your technique. British Journal of Sports Medicine: Is Interval Training the Magic Bullet for Fat Loss? Can I Lose Arm Fat in Two Weeks?